By Hongkiat Lim in WordPress. Updated on August 6, 2016 . If you want to show your Facebook Statuses and you are hosting on a WordPress.com blog that restricts you from installing plugins, try this. 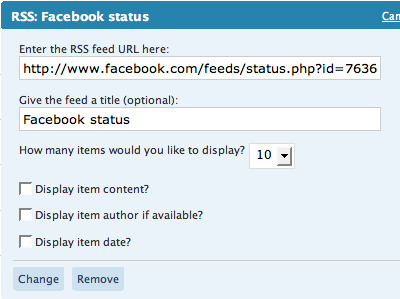 The following method make use of Facebook status feed and WordPress RSS widget. It will also work for self-host WordPress blogs, but you guys who self-host can use better plugins for that. Login into Facebook. Under Profile, look for Mini Feed column, click on See All. Under WordPress admin, Navigate to Design -> Widget. Look for RSS Widget, add it to your side bar. Paste the copied URL inside, give it a name, save and your Facebook statuses (or status depends on how many you display) will now appear on your WordPress blog.